Nottingham Forest's David Vaughan has been suspended for three games after the appeal against the red card shown to the midfielder in Tuesday's draw with Birmingham City was upheld. The 32-year-old was sent off in the second half of the Championship game at the City Ground for an apparent high tackle on Clayton Donaldson. Vaughan has made 25 appearances this season, collecting nine yellow cards. 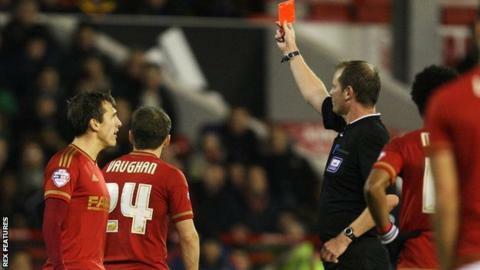 He will be banned for league games against Bolton, Middlesbrough and QPR.